With the Asian Games 2018 just around the corner, one thought that crossed our minds for sure is “How’s our athletes’ preparation for this upcoming big sports event?” Not only that, how prepared Indonesia is actually to be the host for this event? An event where as many as 15.000 athletes and 7000 officials from 40 countries will participate representing their countries and also the moment to showcase the country’s talents and make a name to a bigger audience and hopefully to the world. That day, we had a chance to visit two more training camps. Led by Mr Imam Nahrawi, the Minister of Youth and Sports, himself, we visited training camp for Pencak Silat and Badminton. Our first visit to training camps for athletic, archery and also aquatic stadium and watch the first-hand how the athletes train, has been an eyes opener. Their determination, their disciplines is indeed all or nothing. Again and again, repetitively, practising to reach the standard and targets in Asian Games 2018 which is eight gold medals in total for martial art category. 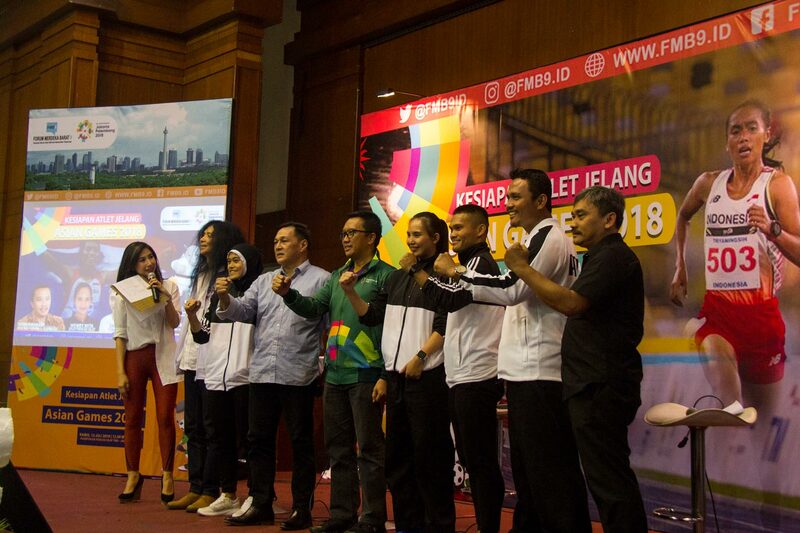 This is the first time for Indonesia’s martial art, Pencak Silat, to be included into Asian Games and Indonesia hopes to get more medals from this sports category. The training camp for Pencak Silat (or locally called as Padepokan Pencak Silat) is located in Taman Mini Indonesia Indah (TMII), one of the popular places to visit in Jakarta. The area is about 5 ha big with few buildings standing within the complex. After the press conference regarding the readiness of our athletes for Asian Games 2018 ended, we headed to the training area. The main training area with stadium layout was filled with people from invited media and bloggers. They were standing surrounding the arena to grab photos and information as much as possible and finally share it out to create more awareness about the readiness of our players and also the upcoming Asian Games 2018 that is only less than a month away. We are as excited as Mr Imam Nahrawi that busy wondering around showing his support to them. Although Pencak Silat is originally from Indonesia, it doesn’t make the athletes lay back in their training and underestimate their opponents. They firmly practice every move of Pencak Silat that determine the scores at the end of the game. Slam, tackle, kick, bare hands or with tools – each move score points against the opponent. Strong doesn’t determine one to be the winner, it is the strongest that applies the right technique that will be the winner. From Padepokan Pencak Silat, TMII, we continued to the next training camp, PBSI (Persatuan Bulu Tangkis Seluruh Indonesia) that is located at Cipayung, behind one rest area that not many people notice. Before reaching that place, we would pass by numbers of houses; it is quite hidden, at the end of one small road. But then in here is where all our badminton players spend most of their time training for all sports event including this Asian Games 2018. In here, we also saw Liliana Natsir and Tontowi Ahmad, and also Kevin Sanjaya and Marcus Gideon that will play in the Asian Games 2018 in mixed doubles and male doubles category respectively. Liliana Natsir and Tontowi Ahmad skip the chance to play in World Tournament for Asian Games 2018. As I have been long never kept myself updates with sports news, I just knew that Liliana Natsir which also fondly called as Butet will retire from badminton after Asian Games. So, this will be her last game to perform representing Indonesia. She said they are often mistaken for having a good life, travelling around and playing badminton in overseas. What the public didn’t know is the amount of hard work they put before they get a chance to play representing the country. They have spent their prime time in this training field. “Our burden is not light. We have to have to go with a target to win each time we go for a competition,” she said as she shared her thoughts about being a national player. “We sacrifice much. Our journey is not easy.” which Mr Imam Nahrawi also agreed with her followed by applause from all of us. Since July 2, three plans from BPTJ toward better road experiences have been executed. Although sometimes I do hear road users complain about the inconvenience especially about the odd and even car plate number scheme in more and more areas, however, I see a significant betterment in the traffic in Jakarta. If everything keeps going this way, I think the target to get every athlete to reach the venue with 30 minutes limit is possible. To support the plans that government has come out with is one of the ways to show our support for Asian Games 2018. Asian Games 2018 will be held in Jakarta and around Jakarta and also in Palembang. Although there are few sports that will happen earlier, however, there are still more than 400 competitions will be happening over the period of two weeks from August 18 to September 2, 2018. If you plan to watch the events live on the spot, do plan well by checking the venue and booking the ticket in advance from the Asian Games 2018 official website. Our athletes have been doing their part for Asian Games 2018. They are ready for the games. What else do you think we can do to support Asian Games 2018? Spill in the comment box below.